It has been 40 years since Levy and colleagues published their landmark study demonstrating a direct link between antibiotic use on farms and the spread of antibiotic resistance to human populations (Levy et al., 1976). That study prospectively followed bacteria in farm animals and farm workers after the introduction of tetracycline-supplemented feed. Within 2 weeks, the bacteria found in the guts of animals fed the tetracycline supplement were nearly all tetracycline resistant (a marked change from baseline). Those tetracycline-resistant bacteria spread to the farm’s laborers such that within 6 months, the laborers’ stool contained more than 80 percent tetracycline-resistant bacteria, compared to less than 7 percent found in samples from neighbors. Furthermore, 6 months after the tetracycline-supplemented feed was removed, the tetracycline-resistant microbes had disappeared entirely from the intestines of all but two of the 10 farm workers tested and was barely detectable (5 percent of isolates) in one of those two workers. Of . . . 92 papers, 114 (59 percent) openly stated or contained evidence to suggest that antibiotic use in agriculture increases the number of resistant infections in humans. Only 15 (eight percent) argued that there was no link between antibiotic use and resistance. The other 63 did not take a clear stance. Further to this, the majority of studies opposing a reduction of agricultural antimicrobial use were authored by people affiliated to either governments or industry, in contrast to the majority of studies that were affiliated to universities. Of the 139 academic studies the Review found, only seven (five percent) argued that there was no link between antibiotic consumption in animals and resistance in humans, while 100 (72 percent) found evidence of a link. . . . In light of this information, we believe that there is sufficient evidence showing that the world needs to start curtailing the quantities of antimicrobials used in agriculture now. Where gaps in the evidence remain, they should be filled. But given all that we know already, it does not make sense to delay action further: the burden of proof should be for those who oppose curtailing the use of antimicrobials in food production to explain why, not the other way around (O’Neill, 2015). The complete failure of our society to address this concern in the United States is profoundly disappointing and alarming to providers who increasingly struggle to care for patients infected with antibiotic-resistant bacteria. Apologists abound. Excuses are rampant. As alluded to by the British report, “more science” is the often-heard refrain. Those who espouse the need for yet further study before action can be taken typically have close links to farms that continue to use antibiotics. Yet we are past the scientific tipping point. The issue at hand is one of policy. All policy issues are matters of choosing between pros and cons, risks and benefits. Policy makers almost never have a perfect understanding of all variables at play, nor is it necessary for them to have such precision of information to make choices. Waiting for perfect science is not possible either, because science is constantly in a state of evolution of knowledge based on changing research. Thus, we seek here to summarize the state of the problem in human terms and to inform policy makers of the risks and benefits of taking action or not. Society is undoubtedly facing a crisis of antibiotic resistance. Distinguished bodies raising the alarm over antibiotic resistance include the World Health Organization, the U.S. Centers for Disease Control and Prevention, the European Centre for Disease Prevention and Control, the European Medicines Agency, the Institute of Medicine, the World Economic Forum, and the U.S. Presidential Advisory Council on Science and Technology (CDC, 2013b; European Centre for Disease Prevention and Control, 2013; IOM, 2010; PCAST, 2014; WHO, 2012, 2014; World Economic Forum, 2013). Antibiotics are among the most potent life-saving interventions in all of medicine. The reductions in death afforded by effective antibiotics for bacterial infections of all types, ranging from simple skin infections to infections of the bloodstream, lung, abdomen, and brain, are enormous (Spellberg, 2010; Spellberg et al., 2011). Within a few years of their availability, antibiotics had reduced the rate of death from infections in the United States by nearly 80 percent, from 280 to 60 deaths per 100,000 population (Spellberg, 2010). The availability of effective antibiotics is necessary to enable modern medical advances that range from intensive care unit medicine to aggressive surgeries, cancer chemotherapy, care for premature neonates, and organ transplantation. Loss of antibiotic efficacy threatens to return society to a time when one in ten patients with a skin infection died and one in three patients with pneumonia died (greater than 10-fold higher death rates compared to the antibiotic era (Spellberg, 2010; Spellberg et al., 2008b; Spellberg et al., 2009). Without effective antibiotics, medicine would be paralyzed by an inability to treat infections resulting from intensive specialty care (Spellberg, 2010; Spellberg et al., 2008a; Spellberg et al., 2011; Spellberg et al., 2013). The U.S. Centers for Disease Control and Prevention very conservatively estimates that 23,000 Americans die of antibiotic-resistant infections each year (CDC, 2013b). The real number may well be four times that much (IDSA, 2004; Spellberg et al., 2008a; Spellberg et al., 2011). The annual cost in the United States of such infections exceeds $20 billion per year (CDC, 2013b). Such infections are not abstract problems for the future; hospital-based health care providers see them every day. We daily encounter infections resistant to first-line antibiotics, and we not infrequently encounter infections resistant to every antibiotic except colistin or tigecycline, two antibiotics that are highly undesirable because of excess toxicity and inadequate efficacy. We are also now seeing pan-resistant infections that are not treatable even with colistin or tigecycline. 2003; Laupland and Church, 2014; Laupland et al., 2007; Russo and Johnson, 2003; Wisplinghoff et al., 2004). Staphylococcus aureus, the most common cause of skin infections and second most common cause of bloodstream infections in patients (Brook and Frazier, 1995; Carratala et al., 2003; Diekema et al., 2001; Sigurdsson and Gudmundsson, 1989; Wisplinghoff et al., 2003a; Wisplinghoff et al., 2003b; Wisplinghoff et al., 2004), is also found on the skin of livestock and on retail meat (Smith, 2015; Smith and Wardyn, 2015). These organisms move easily between farm animals and humans and also from humans to other humans in the community and in health care settings. Such gut and skin bacteria account for a significant proportion of the antibiotic-resistant infections and resulting deaths in the United States and throughout the world. Furthermore, they can serve as repositories for genetic information encoding resistance that can then spread to other types of bacteria that infect humans. We have a crisis of antibiotic resistance. The problem is multifactorial and cannot be addressed by one intervention. A multipronged approach will be required to combat antibiotic resistance (Spellberg et al., 2013). Discussion of the status of the antibiotic pipeline is beyond the scope of this paper; however, we and others have extensively written about it in the past (Spellberg, 2008, 2009, 2010; Spellberg et al., 2011; Spellberg et al., 2013). The fundamental point is that the antibiotic pipeline is unlikely to achieve the robustness of the past because of a combination of scientific, economic, and regulatory challenges. We will not be bailed out by new antibiotics coming to market. Thus we have no choice—we must become far more effective at preserving the precious antibiotics we currently have. As we consider the framework of policy solutions to combat antibiotic resistance, there is a fundamental principle that must be at the heart of our efforts. Antibiotics are unique among all drugs, and virtually unique among all technologies, in that they suffer from transmissible loss of efficacy over time (Spellberg, 2011; Spellberg et al., 2013; Spellberg et al., 2016). Because antibiotic-resistant bacteria spread from person to person, every individual’s use of antibiotics affects the ability of every other person to use the same antibiotics. Your use of an antibiotic affects our ability to use them. Our use affects your grandchildren’s future ability to use them. Antibiotics are therefore a shared societal trust or property. It is not acceptable for one group of people to abuse this trust for the purpose of perceived economic advantage, while harming everyone else. In Western civilization, the rights of the individual have been paramount since the Magna Carta and the establishment of common law principles. Once an individual’s actions negatively affect others, however, limits are placed on those freedoms. For example, in the United States we recognize the rights of adults to consume alcohol, even up to the point of drinking themselves to death. Nevertheless, no person has the right to drink alcohol while driving a car, flying a plane, or doing surgery. The former affects only the individual. The latter affects others in society. The principle behind antibiotic usage is the same. We have the right to use them to benefit patients, but not to abuse them for perceived financial advantage (which may well be a false perception anyway, as discussed further below), in the process harming others. Alexander Fleming, the discoverer of penicillin, warned the public about abuse of antibiotics in a 1945 New York Times interview. He said, “The microbes are educated to resist penicillin and a host of penicillin-fast organisms is bred out. . . . In such cases the thoughtless person playing with penicillin is morally responsible for the death of the man who finally succumbs to infection with the penicillin-resistant organism. I hope this evil can be averted” (Penicillin’s finder assays its future, 1945). Thus, 71 years ago, the man who brought penicillin to civilization also brought into specific relief the moral consequences of abusing this precious, societal trust. It has been known since the late 1940s that feeding sub-therapeutic concentrations of antibiotics to livestock causes them to grow bigger, faster, and less expensively (Coates et al., 1951; Elliott, 2015; Moore et al., 1946; Sneeringer et al., 2015; Stokstad and Jukes, 1950). The mechanism of this effect remains unclear after more than 60 years. Recent evidence from mice suggests that the effect may be due to alterations in the intestinal microbiota, resulting in decreased extraction of calories from food by the bacteria, leaving more available to the host to absorb (Cho et al., 2012). Still, this mechanism was established in lab mice, and it remains speculative whether this is the same mechanism by which the effect occurs in livestock. Nevertheless, there is evidence that feeding antibiotics to livestock can sometimes cause a growth-promoting effect. In Western Europe, efforts have been undertaken over the past 10 to 20 years to curb antimicrobial growth promotion and prophylactic antibiotic use in livestock (Marshall and Levy, 2011; O’Neill, 2015). Such efforts have been largely impossible in the United States because of politics. Even as the United States has continued to experience the growing crisis of antibiotic resistance over the last 15 years, the weight-adjusted amount of antibiotics purchased for use in livestock has increased by approximately 50 percent (from 0.2 to 0.3 grams of antibiotic per kilogram of livestock body weight) (Animal Health Institute, 2008; FDA, 2015; Poultry Site, 2005; USDA, 2016a, 2016b). It is striking that U.S. livestock production uses twofold to eightfold more antibiotics (per kilogram of livestock body weight) than comparable countries in Western Europe (O’Neill, 2015). The staggering load of antimicrobial agents put into livestock in the United States is difficult to fathom. In 2014, U.S. sales of antibiotics for livestock use totaled 15.4 million kilograms of antimicrobial agents—which is 34 million pounds, or 17,000 tons (FDA, 2015). That is fourfold more antimicrobials than are purchased for use in humans in the United States (about 3.5 million kilograms). Thus, antimicrobials for livestock account for 80 percent of the antimicrobials purchased in the United States. The total use of antimicrobials in animals also reflects a more than 20 percent increase in use over the preceding 5 years, a period during which physicians and medical societies have loudly called out warnings about the crisis of antibiotic resistance (Spellberg, 2008, 2009; Spellberg et al., 2011; Spellberg et al., 2013). To pretend that we can address the massive selective pressure for antibiotic resistance that results from antimicrobial use by focusing exclusively on the 20 percent that occurs in humans and ignoring the 80 percent that occurs in animals is to fail as a society. Antibiotic-resistant bacteria bred in livestock spread to humans by multiple routes. Resistant bacteria from animals are shed into soil and groundwater, directly contaminate farm workers, who can then spread these bacteria through human communities via fomites and direct contact, and contaminate meat during the butchering process. Indeed, sampling of retail meat products in food stores consistently reveals high rates of Enterobacteriaceae in chicken, turkey, pork, and beef (Elliott, 2015; Johnson et al., 2006; Making the world safe from superbugs, 2016; NARMS, 2013b; O’Neill, 2015; Sneeringer et al., 2015). An alarming proportion of these bacteria are antibiotic resistant, and when we handle the meat before cooking or ingest meat that is incompletely cooked, we can ingest the antibiotic-resistant bacteria as well. The U.S. Centers for Disease Control and Prevention has estimated that this route of transmission accounts for 20 percent of antibiotic-resistant infections in humans (CDC, 2013a,b; Making the world safe from superbugs, 2016). The actual percentage may well be substantially larger even before accounting for the environmental spread of resistant bacteria, because it is hard to account for additional rounds of human-to-human transmission after the initial introduction of resistant bacteria from animals to humans. National surveillance studies have confirmed Dr. Levy’s original 1976 observations on larger scales—the introduction of fluoroquinolones for livestock use in Spain in 1990 was followed by a marked, accelerated rise in fluoroquinolone-resistant Enterobacteriaceae infections in humans (Silbergeld et al., 2008). A similar phenomenon occurred when fluoroquinolones began to be used in livestock husbandry in the United States (Gupta et al., 2004). Furthermore, Denmark and other countries in the European Union have successfully implemented bans on the routine use of antibiotics (whether for growth promotion or disease prevention), which has led to dramatic reductions in rates of clinical resistance in patients to some of the targeted antibiotics (DANMAP, 2015; Elliott, 2015; O’Neill, 2015; Robinson et al., 2016). Additional specific examples of success associated with reductions targeting a particular antibiotic class can also be found in the United States and Canada. For example, in Quebec, eliminating cephalosporin use in broiler chicken eggs led to precipitous declines in cephalosporin-resistant Enterobacteriaceae in both retail chicken meat and humans, even though human use of antibiotics held constant (Dutil et al., 2010). When the chicken industry partially resumed injecting cephalosporin in broiler chicken eggs in 2006–2007, cephalosporin resistance began to increase again in both animals and humans. Similarly, for use in poultry the United States instituted a complete ban on fluoroquinolones in 2005 and a partial ban on cephalosporins in 2012 (NARMS, 2013a, 2014). Subsequently, FDA testing in 2014 found no fluoroquinolone resistance in retail poultry samples and declining rates of ceftriaxone resistance in Salmonella (FDA, 2016). These experiences are critical to understanding the potential for policy interventions. Radical skeptics who continue to ask for ever-more scientific precision may quibble and point out that in some instances restriction efforts have not reverted resistance rates. Yet, given the complex dynamics of resistance selection and transmission, failure in some interventions is not unexpected, and even slowing or halting an upward climb in resistance should be counted as a success. The point is, in well-described, large-scale cases, restrictions have worked. One cannot prove a negative, but one can prove a positive. The fact that national policies of banning growth promotional and routine prophylactic use of antibiotics have led to reversions in antibiotic resistance rates in people reinforces the argument that feeding antibiotics to animals contributes to the spread of antibiotic resistance to human populations. We may bicker and quibble over what proportion of resistant infections in humans is caused by feeding antibiotics to animals. We may disagree over the extent and severity with which restrictions should be used. We may wish to understand more precisely at the molecular genetic level how bacteria spread from animals to people. But two facts are unassailable: (1) adding antibiotics to animals’ feed and water contributes to the spread of antibiotic-resistant bacteria to human beings; and (2) many parties promote the routine use of antibiotics in livestock specifically because they perceive (possibly incorrectly) that it enables the meat, poultry, and drug industries to maximize production and profits. Thus, a group of people in society are using antibiotics injudiciously to mask inferior management practices for perceived gains in short-term profits, contributing to the spread of antibiotic-resistant bacteria to other people in society. After years of dialogue, the patterns of this debate have settled into a predictable norm. Here are some of the usual justifications proffered by agricultural and pharmaceutical industry spokespersons to prevent even modest restrictions on antibiotic use in livestock production. 1. Livestock will die at alarming rates if we don’t allow antibiotics to be used for growth promotion or routine disease prophylaxis. On its face, this argument is absurd. We are only 80 years into the antibacterial era. Chickens, turkeys, pigs, and cattle evolved tens of millions of years ago. They have only been exposed to antibiotics at appreciable levels in their feed for less than 0.000001 percent of their species’ existence. Clearly they are capable of procreating and expanding their numbers without us feeding them antibiotics. A counter argument may be that modern factory farming houses the animals so closely together, and in such unsanitary conditions, that antibiotics are necessary to keep them from getting sick. The solution then is self-evident: raise the animals in more humane, more sanitary conditions. Denmark and the Netherlands, for instance, are raising large numbers of animals in high-intensity production systems without the use of antibiotics for either growth promotion or routine disease prevention, both of which purposes are prohibited (DANMAP, 2015; Netherlands Ministry of Economic Affairs, 2014). These countries rely on improved husbandry and nonantibiotic techniques such as vaccines to keep their animals healthy, and they have done so in a way in which profits have been maintained and no economic injury to farmers has been apparent (Netherlands Ministry of Economic Affairs, 2014, 2016). Imagine the reaction of patients and the public if hospitals adopted a similar model for patients and crammed 10 patients into a hospital room to save money, giving them all broad-spectrum antibiotics to try to prevent the infections that would inevitably follow. 2. It will be too expensive to raise livestock without antibiotics. Other countries, such as Denmark, have substantially expanded the number of animals produced after banning growth-promoting and routine prophylactic uses of antibiotics in livestock (O’Neill, 2015). Similarly, the Netherlands reduced antibiotic use in livestock by 50 percent between 2009 and 2013, while banning use for both growth promotion and disease prevention (Netherlands Ministry of Economic Affairs, 2014, 2016). Their businesses have not suffered from the restriction, nor have farmers’ or consumers’ costs risen significantly. In addition, a growing number of farmers in the United States are successfully raising food animals while using antibiotics only for treating sick animals. California recently took an important step forward by prohibiting the regular use of antibiotics in livestock (whether for growth promotion or disease prevention) starting in 2018 and is also requiring the collection of data on antibiotic use for the first time in the United States, which could further advance the conversation if done well. (See: Livestock: Use of Antimicrobial Drugs, Senate Bill 27, chap. 758 (October 10, 2015). https://leginfo.legislature.ca.gov/faces/billNavClient.xhtml>bill_id=201520160SB27.) Do we truly have such little confidence in our American farmers outside of California that we believe they cannot be as successful as Danish or Dutch farmers? Furthermore, as mentioned above, the assumption that routine use of antibiotics substantially enhances economic viability of livestock production may no longer be valid. Recent economic reanalysis has indicated that the ability of growth-promoting antibiotic use to improve agribusiness return on investment has been overrated—the practice may now provide only a marginal economic advantage, if any (O’Neill, 2015; Robinson et al., 2016; Teillant and Laxminarayan, 2015). The cost of eliminating routine antibiotic use has been exaggerated. 3. The public will not tolerate any increase in meat cost associated with withdrawing antibiotics from livestock. Quite to the contrary, the public is increasingly demanding meat from animals raised without antibiotics. Many food companies have begun to respond to this market force by moving toward purchasing meat from antibiotic-free vendors. These very large businesses/purchasers include Chipotle, Chick-fil-A, Costco, McDonalds, and Subway (Robinson et al., 2016). Within the last year, chicken companies such as Perdue, Tyson, and Foster Farms have made commitments to eliminate the routine use of medically important antibiotics. They are clearly responding to market demand. In 2012, a Consumer Reports survey found that 86 percent of consumers polled said that meat and poultry raised without antibiotics should be available in their local supermarket; more than 60 percent said they would be willing to pay at least $0.05 cents per pound more for it, and nearly 40 percent said they would pay an extra $1 or more per pound (Meat on drugs, 2012). As the public has become more educated and aware of the antibiotic resistance crisis, they are increasingly voting with their wallets. Sales estimates of meat raised without any antibiotics increased 25 percent from 2009 to 2011 (Perrone, 2012). The increase occurred despite an overall decline in U.S. per capita meat consumption. USDA-certified organic meats—just one part of the market for meat raised without routine use of antibiotics—were the fastest-growing segment of the $31 billion organic foods industry in 2011 (Organic Trade Association, 2012). In 2013, sales of organic meat, poultry, and fish were up 11 percent over the prior year, to $675 million (Organic Trade Association, 2014). Ultimately, market forces may well be a significant part of the solution to this societal conundrum in the United States. This claim is patently false. Of the antibiotics sold for use in livestock in 2014, 9.5 million kilograms were identical or very similar to those used in humans (FDA, 2015). Furthermore, some of the drugs that are not considered “medically important” are similar in mechanism to antibiotics used in humans and have the substantial potential to trigger cross-resistance (Marshall and Levy, 2011). In addition, the currently used definition of which antibiotics are medically important is incomplete and evolving. One antibiotic that is not considered medically important is bacitracin, but it is used in patients quite commonly, albeit topically rather than systemically. If we lose bacitracin for topical use, we will be forced to use other antibiotics in its place. Therefore, some of the agents that are described as “not medically important” are in fact medically important to physicians. Furthermore, even the FDA acknowledges that other antibiotics may become medically important: it uses the term “not currently medically important” to describe these antibiotics in its latest report on sales of antibiotics for food animals (FDA, 2015). Finally, because many antibiotic resistance mechanisms are genetically linked (physically connected) in genomes or mobile genetic elements, use of one antimicrobial agent can select for resistance to another, even if the agents are unrelated with respect to chemical structure, target, or resistance mechanism (Marshall and Levy, 2011). Thus, exposure to antimicrobial agents that are not used in human medicine has the potential to select for resistance to agents that are used in human medicine. We should not allow this risk to be dismissed categorically by those who have a vested interest in continuing current farming practices. The global human community has an ongoing and worsening crisis of antibiotic-resistant infections in patients. We cannot count on new antibiotics to save us from this crisis—the pipeline is inadequate. We must do a much better job of preserving the effectiveness of the antibiotics we have now. We must therefore use fewer antibiotics. Because nearly 80 percent of antimicrobial use in the United States is in livestock, we must do a much better job of reducing antibiotic use in livestock as well as in humans. It is important that we not be bogged down or distracted by quibbles over the minutiae of the molecular mechanisms by which antibiotic resistance spreads from animals to humans or the precise proportion of antibiotic-resistant infections in humans that is caused by antibiotic use in animals. The fundamental point is that antibiotic-resistant microbes can move from livestock fed antibiotics to humans, that patients are harmed as a result of this process, and that, in some countries, national policies eliminating growth promotion and routine prophylactic use have reverted or slowed antibiotic resistance rates. Thus, from a policy perspective, the real question is, what is the “pro” of antimicrobial use in animals that might cause society to agree to take on the corresponding “con”—the risk of harming humans by this use? The pro is the ability of industrial farms to take shortcuts in animal husbandry to increase the potential for profit. So this issue—like so many others—boils down to societal priorities. This is not a science question, it is a policy question. Do we, as a society, believe that livestock producers should be afforded the right to profligate antimicrobial use by growing animals in unsanitary and crowded conditions despite the clear associated risk of transmission of antibiotic-resistant bacteria from animals to humans, resulting in harm to humans? That is the question that confronts us as a society. infections, we should be consuming less meat. This real, transformative opportunity has had insufficient attention at the level of national health and commerce policy. Note: Affiliations for the authors of this paper are shown for identification purposes only. The opinions stated in the manuscript do not reflect or represent those of the institutions or employers shown. Animal Health Institute. 2008. 2007 Antibiotics sales. http://www.ahi.org/archives/2008/11/2007-antibiotics-sales/ (accessed May 14, 2016). Brook, I., and E. H. Frazier. 1995. Clinical features and aerobic and anaerobic microbiological characteristics of cellulitis. Archives of Surgery 130(7):786–792. Carratala, J., B. Roson, N. Fernandez-Sabe, E. Shaw, O. del Rio, A. Rivera, and F. Gudiol. 2003. Factors associated with complications and mortality in adult patients hospitalized for infectious cellulitis. European Journal of Clinical Microbiology and Infectious Diseases 22(3):151–157. CDC (U.S. Centers for Disease Control and Prevention). 2013a. Antibiotic resistance from the farm to the table. http://www.cdc.gov/foodsafety/challenges/from-farm-to-table.html (accessed May 17, 2016). CDC. 2013b. Antibiotic resistant threats in the United States, 2013. http://www.cdc.gov/drugresistance/threat-report-2013/pdf/ar-threats-2013-508.pdf (accessed November 16, 2013). Cho, I., S. Yamanishi, L. Cox, B. A. Methe, J. Zavadil, K. Li, Z. Gao, D. Mahana, K. Raju, I. Teitler, H. Li, A. V. Alekseyenko, and M. J. Blaser. 2012. Antibiotics in early life alter the murine colonic microbiome and adiposity. Nature 488(7413):621–626. Coates, M. E., C. D. Dickinson, G. F. Harrison, S. K. Kon, S. H. Cummins, and W. F. Cuthbertson. 1951. Mode of action of antibiotics in stimulating growth of chicks. Nature 168(4269):332. DANMAP (Danish Integrated Antimicrobial Resistance Monitoring and Research Programme). 2015. Danmap 2014: Use of antimicrobial agents and occurrence of antimicrobial resistance in bacteria from food animals, food and humans in Denmark. http://www.danmap.org/~/media/Projekt%20sites/Danmap/DANMAP%20reports/DANMAP%202014/Danmap_2014.ashx (accessed May 14, 2016). Davis, G. S., and L. B. Price. 2016. Recent research examining links among klebsiella pneumoniae from food, food animals, and human extraintestinal infections. Current Environmental Health Reports 3(2):128–135. Davis, G. S., K. Waits, L. Nordstrom, B. Weaver, M. Aziz, L. Gauld, H. Grande, R. Bigler, J. Horwinski, S. Porter, M. Stegger, J. R. Johnson, C. M. Liu, and L. B. Price. 2015. Intermingled klebsiella pneumoniae populations between retail meats and human urinary tract infections. Clinical Infectious Diseases 61(6):892–899. Diekema, D. J., M. A. Pfaller, F. J. Schmitz, J. Smayevsky, J. Bell, R. N. Jones, and M. Beach. 2001. Survey of infections due to staphylococcus species: Frequency of occurrence and antimicrobial susceptibility of isolates collected in the United States, Canada, Latin America, Europe, and the Western Pacific Region for the sentry antimicrobial surveillance program, 1997–1999. Clinical Infectious Diseases 32(Suppl 2):S114–S132. Diekema, D. J., S. E. Beekmann, K. C. Chapin, K. A. Morel, E. Munson, and G. V. Doern. 2003. Epidemiology and outcome of nosocomial and community-onset bloodstream infection. Journal of Clinical Microbiology 41(8):3655–3660. Dutil, L., R. Irwin, R. Finley, L. K. Ng, B. Avery, P. Boerlin, A. M. Bourgault, L. Cole, D. Daignault, A. Desruisseau, W. Demczuk, L. Hoang, G. B. Horsman, J. Ismail, F. Jamieson, A. Maki, A. Pacagnella, and D. R. Pillai. 2010. Ceftiofur resistance in Salmonella enterica serovar heidelberg from chicken meat and humans, Canada. Emerging Infectious Diseases 16(1):48–54. Elliott, K. 2015. Antibiotic on the farm: Agriculture’s role in drug resistance. Center for Global Development. http://www.cgdev.org/sites/default/files/CGD-Policy-Paper-59-Elliott-AntibioticsFarm-Agriculture-Drug-Resistance.pdf (accessed May 8, 2016). European Centre for Disease Prevention and Control. 2013. Antimicrobial resistance surveillance in Europe 2012. Annual Report of the European Antimicrobial Resistance Surveillance Network (EARS-Net). Stockholm: European Centre for Disease Prevention and Control. FDA (U.S. Food and Drug Administration). 2015. Summary report on antimicrobials sold or distributed for use in food-producing animals. http://www.fda.gov/downloads/ForIndustry/UserFees/AnimalDrugUserFeeActADUFA/UCM476258.pdf (accessed May 8, 2016). FDA. 2016. FDA NARMS retail meat interim report for salmonella shows encouraging early trends continue; includes whole genome sequencing data for the first time. http://www.fda.gov/AnimalVeterinary/NewsEvents/CVMUpdates/ucm498038.htm; http://www.fda.gov/downloads/AnimalVeterinary/SafetyHealth/AntimicrobialResistance/NationalAntimicrobialResistanceMonitoringSystem/UCM498134.pdf (accessed May 8, 2016). Gupta, A., J. M. Nelson, T. J. Barrett, R. V. Tauxe, S. P. Rossiter, C. R. Friedman, K. W. Joyce, K. E. Smith, T. F. Jones, M. A. Hawkins, B. Shiferaw, J. L. Beebe, D. J. Vugia, T. Rabatsky-Ehr, J. A. Benson, T. P. Root, F. J. Angulo, and N. W. Group. 2004. Antimicrobial resistance among campylobacter strains, United States, 1997–2001. Emerging Infectious Diseases 10(6):1102–1109. IDSA (Infectious Disease Society of America). 2004. Bad bugs, no drugs. White Paper. Alexandria, VA: Infectious Diseases Society of America. IOM (Institute of Medicine). 2010. Antibiotic resistance: Implications for global health and novel intervention strategies: Workshop summary. Edited by E. R. Choffnes, D. A. Relman, and A. Mack. Washington, DC: The National Academies Press. Johnson, J. R., M. A. Kuskowski, M. Menard, A. Gajewski, M. Xercavins, and J. Garau. 2006. Similarity between human and chicken Escherichia coli isolates in relation to ciprofloxacin resistance status. Journal of Infectious Diseases 194(1):71–78. Laupland, K. B., and D. L. Church. 2014. Population-based epidemiology and microbiology of community-onset bloodstream infections. Clinical Microbiology Reviews 27(4):647–664. Laupland, K. B., D. B. Gregson, W. W. Flemons, D. Hawkins, T. Ross, and D. L. Church. 2007. Burden of community-onset bloodstream infection: A population-based assessment. Epidemiology and Infection 135(6):1037–1042. Levy, S. B., G. B. FitzGerald, and A. B. Macone. 1976. Changes in intestinal flora of farm personnel after introduction of a tetracycline-supplemented feed on a farm. New England Journal of Medicine 295(11):583–588. Making the world safe from superbugs. 2016. Consumer Reports. http://www.consumerreports.org/cro/health/making-the-world-safe-from-superbugs/index.htm (accessed May 8, 2016). Marshall, B. M., and S. B. Levy. 2011. 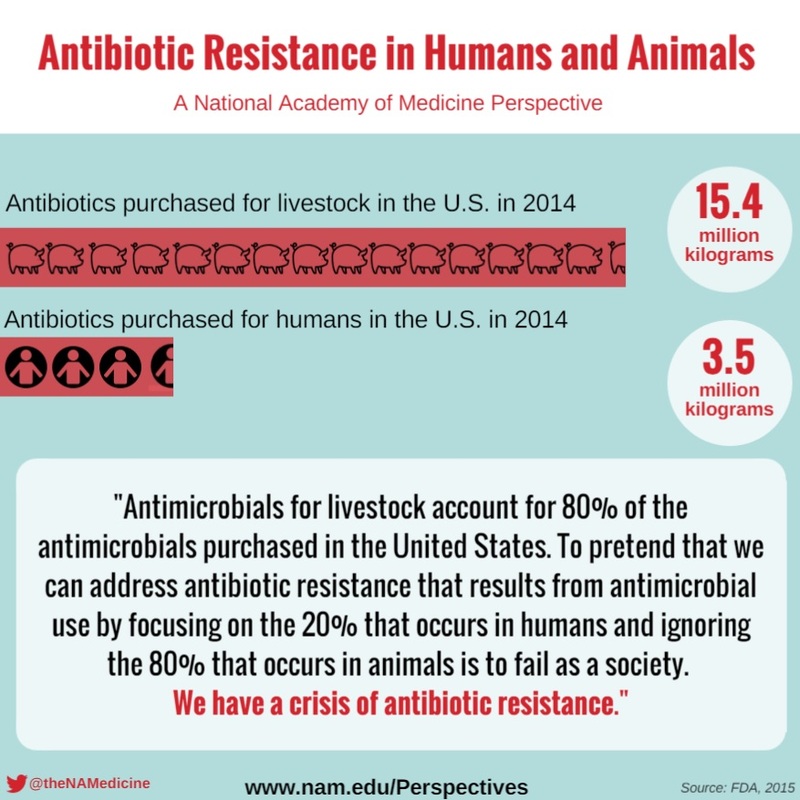 Food animals and antimicrobials: Impacts on human health. Clinical Microbiology Reviews 24(4):718–733. Meat on drugs. 2012. Consumer Reports. http://www.consumerreports.org/content/dam/cro/news_articles/health/CR%20Meat%20On%20Drugs%20Report%2006-12.pdf (accessed May 8, 2016). Moore, P. R., A. Evenson, T.D. Luckey, E. McCoy, C.A. Elvehjem, and E.B. Hart. 1946. Use of sulfasuxidine, streptothricin, and streptomycin in nutritional studies with the chick. Journal of Biological Chemistry 165(2):437–441. NARMS (National Antimicrobial Resistance Monitoring System). 2013a. 2012 Retail meat report. U.S. Food and Drug Administration. http://www.fda.gov/downloads/AnimalVeterinary/SafetyHealth/AntimicrobialResistance/NationalAntimicrobialResistanceMonitoringSystem/UCM442212.pdf (accessed May 8, 2016). NARMS. 2013b. The national antimicrobial resistance monitoring system: Enteric bacteria. U.S. Food and Drug Administration. http://www.fda.gov/downloads/AnimalVeterinary/SafetyHealth/AntimicrobialResistance/NationalAntimicrobialResistanceMonitoringSystem/UCM453398.pdf (accessed May 8, 2016). NARMS. 2014. NARMS integrated report: 2012–2013. U.S. Food and Drug Administration. http://www.fda.gov/downloads/AnimalVeterinary/SafetyHealth/AntimicrobialResistance/NationalAntimicrobialResistanceMonitoringSystem/UCM453398.pdf (accessed May 8, 2016). Netherlands Ministry of Economic Affairs. 2014. Reduced and responsible: Use of antibiotics in food-producing animals in the Netherlands. https://www.government.nl/documents/leaflets/2014/02/28/reduced-and-responsible-use-ofantibiotics-in-food-producing-animals-in-the-netherlands (accessed May 8, 2016). Netherlands Ministry of Economic Affairs. 2016. AMR next: EU Antimicrobial Resistance One Health Ministry Conference 2016. https://www.government.nl/topics/antibioticresistance/documents/leaflets/2016/04/18/factsheet-eu-antimicrobial-resistance-one-healthministerial-conference-2016 (accessed May 8, 2016). Nordstrom, L., C. M. Liu, and L. B. Price. 2013. Foodborne urinary tract infections: A new paradigm for antimicrobial-resistant foodborne illness. Frontiers in Microbiology 4:29. O’Neill, J. 2015. Antimicrobials in agriculture and the environment: Reducing unnecessary use and waste: The review on antimicrobial resistance. http://amrreview.org/sites/default/files/Antimicrobials%20in%20agriculture%20and%20the%20environment%20-%20Reducing%20unnecessary%20use%20and%20waste.pdf (accessed May 8, 2016). Organic Trade Association. 2012. Consumer-driven U.S. organic market surpasses $31 billion in 2011. https://www.ota.com/news/press-releases/17093 (accessed May 8, 2016). Organic Trade Association. 2014. American appetite for organic products breaks through $35 billion mark. https://www.ota.com/news/press-releases/17165 (accessed May 8, 2016). PCAST (President’s Council of Advisors on Science and Technology). 2014. Report to the president on combating antibiotic resistance. Executive Office of the President. http://www.whitehouse.gov/sites/default/files/microsites/ostp/PCAST/pcast_carb_report_sept2014.pdf (accessed January 2, 2015). Penicillin’s finder assays its future. 1945. New York Times, June 26. Perrone, M. 2012. Does giving antibiotics to animals hurt humans? USA Today, April 20. http://usatoday30.usatoday.com/news/health/story/2012-04-20/antibiotics-animals-humanmeat/54434860/1 (accessed May 8, 2016). Poultry Site. Antibiotic use in U.S. animals rises in 2004. 2005. http://www.thepoultrysite.com/poultrynews/7985/antibiotic-use-in-us-animals-rises-in-2004/ (accessed May 14, 2016). Robinson, T. P., H. F. Wertheim, M. Kakkar, S. Kariuki, D. Bu, and L. B. Price. 2016. Animal production and antimicrobial resistance in the clinic. Lancet 387(10014):e1–3. Russo, T. A., and J. R. Johnson. 2003. Medical and economic impact of extraintestinal infections due to Escherichia coli: Focus on an increasingly important endemic problem. Microbes and Infection 5(5):449–456. Sigurdsson, A. F., and S. Gudmundsson. 1989. The etiology of bacterial cellulitis as determined by fineneedle aspiration. Scandinavian Journal of Infectious Diseases 21(5):537–542. Silbergeld, E. K., J. Graham, and L. B. Price. 2008. Industrial food animal production, antimicrobial resistance, and human health. Annual Review of Public Health 29:151–169. Smith, T. C. 2015. Livestock-associated Staphylococcus aureus: The United States experience. PLoS Pathogens 11(2):e1004564. Smith, T. C., and S. E. Wardyn. 2015. Human infections with Staphylococcus aureus cc398. Current Environmental Health Reports 2(1):41–51. Sneeringer, S., J. MacDonald, N. Key, W. McBride, and K. Mathews. 2015. Economics of antibiotic use in U.S. livestock production. U.S. Department of Agriculture. http://www.ers.usda.gov/media/1950577/err200.pdf (accessed May 8, 2016). Spellberg, B. 2008. Antibiotic resistance and antibiotic development. Lancet Infectious Diseases 8:211–212. Spellberg, B. 2009. Rising plague: The global threat from deadly bacteria and our dwindling arsenal to fight them. New York: Prometheus Press. Spellberg, B. 2010. The antibacterial pipeline: Why is it drying up, and what must be done about it? In Antibiotic resistance: Implications for global health and novel intervention strategies: Workshop summary. Washington, DC: The National Academies Press. Pp. 299–332. Spellberg, B. 2011. The antibiotic crisis: Can we reverse 65 years of failed stewardship? Archives of Internal Medicine 171(12):1080–1081. Spellberg, B., R. Guidos, D. Gilbert, J. Bradley, H. W. Boucher, W. M. Scheld, J. G. Bartlett, and J. Edwards, Jr. 2008a. The epidemic of antibiotic-resistant infections: A call to action for the medical community from the Infectious Diseases Society of America. Clinical Infectious Diseases 46(2):155–164. Spellberg, B., G. H. Talbot, E. P. Brass, J. S. Bradley, H. W. Boucher, and D. Gilbert. 2008b. Recommended design features of future clinical trials of anti-bacterial agents for community-acquired pneumonia. Position Paper. Clinical Infectious Diseases 47(S3):S249–S265. Spellberg, B., G. H. Talbot, H. W. Boucher, J. S. Bradley, D. Gilbert, W. M. Scheld, J. E. J. Edwards, and J. G. Bartlett. 2009. Antimicrobial agents for complicated skin and skin structure infections: Justification of non-inferiority margins in the absence of placebo-controlled trials. Clinical Infectious Diseases 49:383–391. Spellberg, B., M. Blaser, R. Guidos, H. W. Boucher, J. S. Bradley, B. Eisenstein, D. Gerding, R. Lynfield, L. B. Reller, J. Rex, D. Schwartz, E. Septimus, F. C. Tenover, and D. N. Gilbert. 2011. Combating antimicrobial resistance: Policy recommendations to save lives. Clinical Infectious Diseases 52(S5):S397–S428. Spellberg, B., J. G. Bartlett, and D. N. Gilbert. 2013. The future of antibiotics and resistance. New England Journal of Medicine 368(4):299–302. Spellberg, B., A. Srinivasan, and H. F. Chambers. 2016. New societal approaches to empowering antibiotic stewardship. Journal of the American Medical Association 315(12):1229–1230. Stokstad, E. L. R., and T. H. Jukes. 1950. Further observations on the “animal protein factor.” Experimental Biology and Medicine 73:523–528. Teillant, A., and R. Laxminarayan. 2015. Economics of antibiotic use in U.S. swine and poultry production. Choices. http://www.choicesmagazine.org/choices-magazine/theme-articles/themeoverview/economics-of-antibiotic-use-in-us-swine-and-poultry-production (accessed May 14, 2016). USDA (U.S. Department of Agriculture). 2016a. Livestock slaughter annual summary. http://usda.mannlib.cornell.edu/MannUsda/viewDocumentInfo.do?documentID=1097 (accessed May 14, 2016). USDA. 2016b. Poultry slaughter. http://usda.mannlib.cornell.edu/MannUsda/viewDocumentInfo.do?documentID=1131 (accessed May 14, 2016). WHO (World Health Organization). 2012. The evolving threat of antimicrobial resistance: Options for action. http://apps.who.int/iris/bitstream/10665/44812/1/9789241503181_eng.pdf (accessed May 8, 2016). WHO. 2014. Antimicrobial resistance: Global report on surveillance. http://apps.who.int/iris/bitstream/10665/112642/1/9789241564748_eng.pdf?ua=1 (accessed May 5, 2014). Wisplinghoff, H., H. Seifert, S. M. Tallent, T. Bischoff, R. P. Wenzel, and M. B. Edmond. 2003a. Nosocomial bloodstream infections in pediatric patients in United States hospitals: Epidemiology, clinical features and susceptibilities. Pediatric Infectious Disease Journal 22(8):686–691. Wisplinghoff, H., H. Seifert, R. P. Wenzel, and M. B. Edmond. 2003b. Current trends in the epidemiology of nosocomial bloodstream infections in patients with hematological malignancies and solid neoplasms in hospitals in the United States. Clinical Infectious Diseases 36(9):1103–1110. Wisplinghoff, H., T. Bischoff, S. M. Tallent, H. Seifert, R. P. Wenzel, and M. B. Edmond. 2004. Nosocomial bloodstream infections in US hospitals: Analysis of 24,179 cases from a prospective nationwide surveillance study. Clinical Infectious Diseases 39(3):309–317. World Economic Forum. 2013. Global risks. 8th ed. http://www3.weforum.org/docs/WEF_GlobalRisks_Report_2013.pdf (accessed November 16, 2013). Brad Spellberg, M.D., is chief medical officer of the Los Angeles County+University of Southern California (LAC+USC) Medical Center and professor of medicine and associate dean for clinical affairs at the Keck School of Medicine of USC. Gail R. Hansen, D.V.M., M.P.H., is a senior consultant in veterinary medicine and science policy at Hansen Consulting, LLC. Avinash Kar, J.D., is senior attorney in the health and environment program at the Natural Resources Defense Council. Carmen D. Cordova, Ph.D., is a staff scientist in the food and agriculture program at the Natural Resources Defense Council. Lance B. Price, Ph.D., is director of the Antibiotic Resistance Action Center and professor at the Milken Institute School of Public Health, George Washington University. James R. Johnson, M.D., is professor of medicine at the University of Minnesota and staff physician and director of the Molecular Epidemiology Unit, Minneapolis VA Healthcare System. The authors are participants in the activities of the Food Forum of the National Academies of Sciences, Engineering, and Medicine. The authors would like to thank Dr. Michael Osterholm for his helpful comments and wisdom and for his many years of leadership in the field.